Sudhakar's colleagues Anand and Kajal happened to stumble upon this gem of a place on Castle Street. Its just a few metres away from Asean, on the opposite side. It opened in the first week of October and serves "Food from the Valley". We went there this past weekend and had the place to ourselves. The owner, Javaid Ahmed, a Kashmiri welcomed us. One look at the menu and we knew we had to ask for suggestions on having the right combination of dishes. Thankfully Javaid is your man for this. We were first served Kahwa, the traditional Kashmiri tea made with saffron. 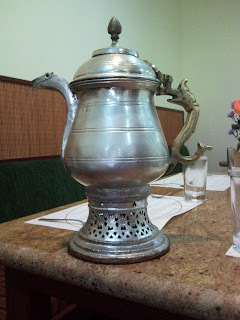 Javaid even brought out the Samovar in which it is made. Once you open it, it has a central tube down which you put coal and place the tea all around it to simmer. 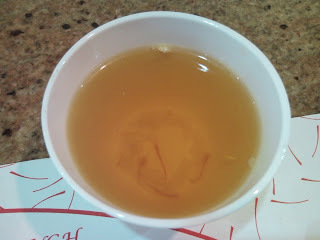 The tea is light and refreshing (A similar feeling to Jasmine Chinese tea but with a saffron flavor) and the treat is at the end of the cup when you find finely chopped pista. Starters was Seekh Kebab Koshiq Maaz (lamb appetisers). 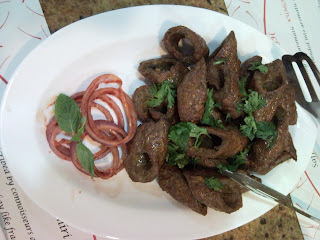 These ringlets of meat were well pounded with subtle spices and each morsel was soft as were the Talith Cockur or Koshiq Cockur (chicken appetisers). 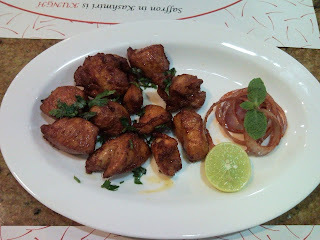 These looked like bite-sized pieces of tandoori chicken. Tandoori they were, but the softness of the meat and exquisite blending of the marinade will have you drooling for more. 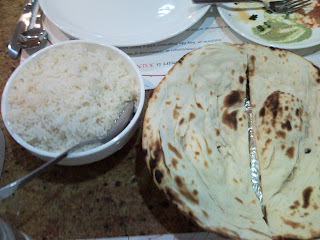 Main course was steaming hot rice and a tandoori roti. We were egged on to try the roti for its fluffiness and softness. And soft as spoonful of whipped cream they were. 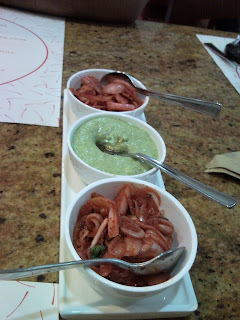 Best part was they remained the same way till almost the end of the meal (which was when Sudhakar had his). The secret, Javaid of course did not tell us. But he did say that most places used egg in their rotis which made them soft when just of the fire, but hard as a frisbee within 5 minutes on your table. 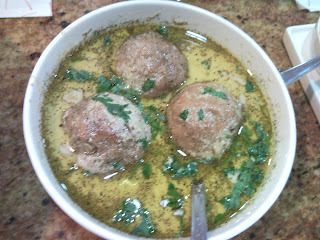 To go with this was Yakhni - lamb dumplings in a yoghurt gravy. The meat balls were smooth, unlike the coarse, egg batter fried balls that one normally gets. The meat inside was smooth without a trace of fibre. This, Javaid said is the result of pounding the meat for a minimum of 3 hours. 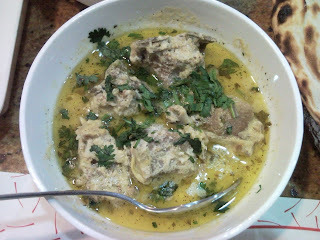 Next was a Dhaniwal Cockur or a Chicken in yogurt gravy flavored with coriander leaves. On first look I thought it was chicken in the same gravy. Javaid caught that look and immediately served me a helping asking me to taste it and see how different it was. And without doubt, it was really different and absolutely delidicous (as Anoushka would say). Against the satisfied groaning of our tummies out came a rogan josh which Javaid said would rival anything similarly named that we have had till today. 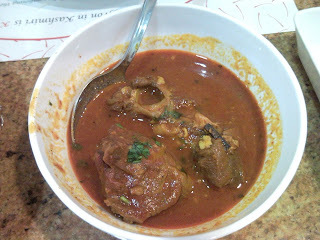 And unbelievably this rogan josh was not the thick tomato-onion-cashew paste mix that we normally eat. The true rogan josh, we were explained does not even use tomatoes. This was a light red gravy with the meat not asking for permission to fall of the bone. 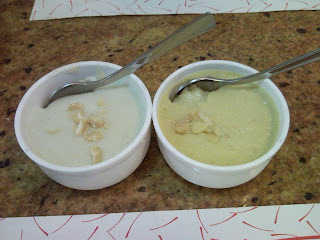 Can we leave without a dessert - and a phirni with saffron flavoring and another with rose water was brought on. And boy was this a wonderful end to a great meal. Cold and spot on. 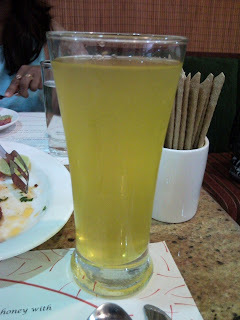 We also had a saffron lemon soda. Actually trying to discover all the ways saffron can be savored. If you want to savor multiple delicacies at one go - opt for Wazwan, the ritualistic celebratory meal of Kashmir. Kungh is small and seats about 25 people at a time. Kungh is one place where you will repeatedly be thinking of the softness of the dishes that come to your table. The place is really good friends with the AC and so take a sweater along if you are like me and need someone to sneeze to feel cold. Your bill for two will roughly come to Rs 800 and be warned, Javaid loves to feed his patrons. So don't look surprised when you find something that you didn't order on your table. The one unisex look is clean. Javaid is a pleasure to talk to and is a miniature treasure trove of tidbits on cooking in Kashmir and commercial cooking in restaurants.